In a thick bottomed kadai, put the oil and when it is hot add mustard, urad dhal, bengal gram dhal, pepper and jeera, green chillies and chopped ginger and fry till the dhals become light brown. Then add oats and rawa to the seasoning and fry for few seconds or till it is hot to touch (Need not fry for a long time). Pour water in the idli cooker and bring to boil. 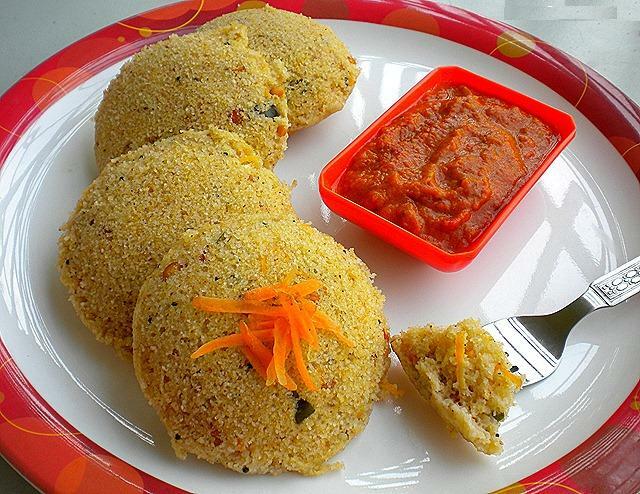 Grease idli plate and pour the idli batter and steam cook it for 8 to 10 minutes. Make sure the water boils well before keeping the idli stand in the idli cooker. pouring the batter in the idli plate, you can sprinkle little carrot gratings / tomato cut into small stripes in the idli plate and then pour the batter over it. You will get colourful idli. Also you can add a cup of cut vegetables like green peas, carrot, cauliflower to the batter and make vegetable idli also. If you are using whole oats, then just grind to a coarse powder like rawa and then add it. If you do not have Fruit Salt, then add a pinch of cooking soda.